In recent weeks, the Senate has failed to pass “repeal and replace” health care legislation, at least for the time being, and both President Trump and Republican Congressional leaders have once again set their sights on tax reform, with promises of passage during 2017. 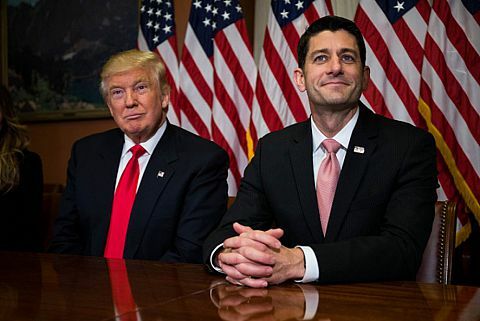 On July 27, 2017, a joint statement on tax reform was issued by House Speaker Paul Ryan, Senate Majority Leader Mitch McConnell, Treasury Secretary Steven Mnuchin, National Economic Council Director Gary Cohn, Senate Finance Committee Chairman Orrin Hatch, and House Ways and Means Committee Chairman Kevin Brady. The six-paragraph statement set forth broadly agreed-upon principles for tax reform – e.g., simplifying the tax code, lowering tax rates for small businesses and families, encouraging American companies to bring back jobs and profits currently “trapped” overseas. The statement also acknowledges that, going forward, outlines for tax reform will not include a “border tax.” This provision, which, simply put, would have taxed companies’ purchases from other countries, while exempting U.S. purchases, was highly controversial, with many industry groups opposing it. On August 1, 2017, a letter signed by 45 of 48 members of the Senate Democratic Caucus outlined conditions for working with the Trump administration and congressional Republicans on tax reform. These conditions include: no tax cuts for the wealthiest 1% of taxpayers, no tax increases for the middle class, no increase to the budget deficit, and no cuts to programs such as Medicare, Medicaid, and Social Security. The signators also insist that Republicans return to “regular order,” and not use the “reconciliation” process to pass tax reform (at present, Senator McConnell believes using “reconciliation” will be necessary). While the Republican party currently controls both houses of Congress as well as the White House, over the first six months of Donald Trump’s presidency, no significant legislation affecting domestic policy has been enacted; such steps as President Trump has been able to take have been made via executive order. We believe tax reform cannot be unilaterally undertaken, and the President and Congress will have to compromise with Senate and House Democrats to enact some form of tax legislation. President Trump seems to be aware of this stumbling block – which could perhaps also be an opportunity. Both the White House and the Treasury Department have reached out to, and met with, Democratic leaders on the subject of tax reform, and White House legislative affairs director Marc Short stressed the need to bring Democrats on board at an Americans for Prosperity-sponsored gathering of conservative activists on July 31, 2017. In an August 1, 2017, interview with Fox News, Karl Rove, former advisor to President George W. Bush, expressed moderate optimism that some form of tax reform may be passed in 2017, but cautioned that “lowered expectations” are necessary. Mr. Rove also expressed agreement with a recent Wall Street Journal opinion piece, which advocated that President Trump use the “bully pulpit” of the White House to promote tax reform via televised addresses from the Oval Office. • Assemble a clear, concise preliminary proposal, including only the top 3 to 5 specific tax code targets they want to address – those that will deliver the greatest beneficial impact to the American people, e.g., provisions that will help create jobs. • Set the agenda with the American people – take the case for tax reform directly to them, with clear messaging outlining the benefits of the proposals offered. • President Trump and Treasury Secretary Mnuchin should continue meeting with Democratic leaders, seeking their input and explaining the basis for their stances. • President Trump is traveling to various states to gain broader support for tax reform; we applaud this effort, and would encourage the President to take the advice of Mr. Rove and the Wall Street Journal, and reach out to the nation from the “bully pulpit” via televised addresses to explain the need for tax reform. • Lobby Congress, and keep tax reform at the top of the agenda – this is a mechanism Presidents have long used to promote their agendae. • Both the President and Congressional Republicans should be open to negotiation, and attempt to build bi-partisan support for a few key proposals. • All policy details should be thoroughly addressed, hashed out, and clearly set forth before any bill is presented to either the House Ways and Means Committee or the Senate Finance Committee. All potential consequences of each tax reform proposal should be analyzed and understood. • We believe that enacting any meaningful change to the tax code will be a difficult process. To effectively lead the charge, President Trump will need to demonstrate that he is determined to stay the course. He will need to maintain pressure on Congressional leaders from both sides of the aisle; he will also need flexibility, and a willingness to collaborate. The president has an opportunity to get the ball rolling on much-needed changes to the U.S. tax code – we encourage him to take full advantage of it. We are cautiously optimistic that modest tax reform may see passage in 2017. Tax reform has the potential to affect many taxpayers, both individual and corporate. Call us today – we can help you position yourself to take advantage of tax breaks likely to affect you, your business, and your family, while protecting yourself under the current tax code. Stay tuned to our blog for updates and commentary, as new developments arise.